Otis 2's Story . . . 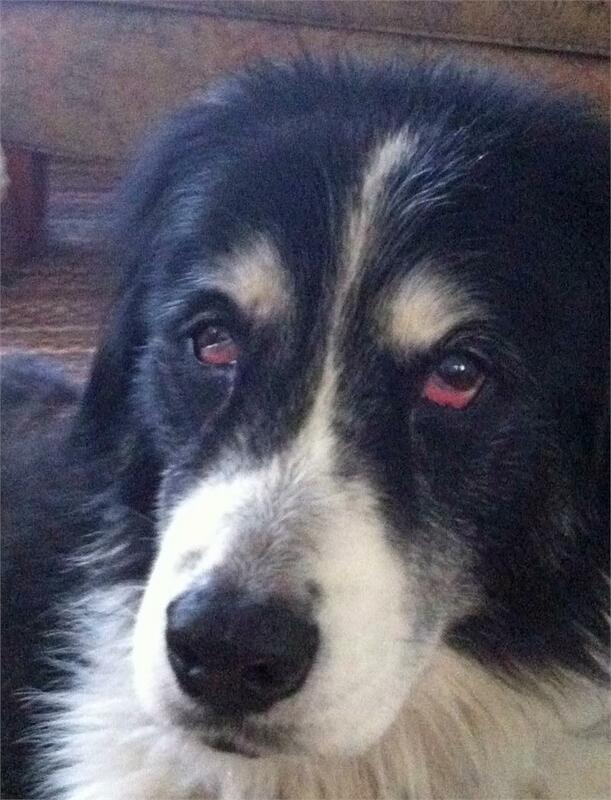 It was with deeply sad and heavy hearts that Otis’s family helped him to cross the Rainbow Bridge. His family is devastated and heartbroken to say goodbye to their very special boy. Otis had not been himself of late. In April he was sick, lost weight, and slowed down tremendously. Weakness was especially noticed in his hind legs. Recently Otis fell in his yard while chasing squirrels with his canine sister. Otis came to MAESSR over a year ago when his owner was killed in a car accident. He found his forever home with his MAESSR parents who opened their home and hearts to Otis, giving him their unconditional love. It is their wish that he be reunited with his human across the Bridge and let him know how good his life was while he was waiting to join him. Spring has arrived and that means lots of activity in Otis’s home. Much of that time is spent in the yard, getting it all cleaned up with lots of busyness outside for the entire family. For his part, Otis is enjoying the cool weather and has been a busy guy. He loves chasing critters out of his yard. He has also made 2 new canine friends who stop by his house on their way home from their walk to say “hi.” Otis loves the visits with his new buddies and waits for them to round the corner of the yard every day. They chat up a storm, tails wagging until the humans let them know it’s time to head inside. Otis went to the Richmond Springerfest with his foster mom. The car was a little crowded, because Otis’s mission was to deliver donations to MAESSR from friends. The ride home was much better; he stretched out and napped most of the way. 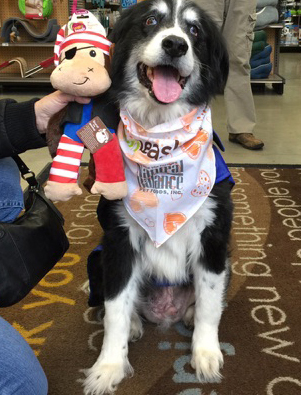 He had a great time seeing everyone, humans and pups alike. He was glad to get home; it was obvious he missed his dad. Otis greeted him with a wagging tail and his famous kisses. Already Otis cannot wait until fall when the weather is cool again and more picnics are planned. He hopes you’ll come by to say “hello” to him at those gatherings too! Recently Otis went to the vet for his annual checkup and got a great report. Yay Odie!! Next was a trip to the groomers for a spa day. He did very well, even though standing for long periods is hard for him. Woo-hoo…he looks so very handsome again. Another mini-milestone (but who’s counting, Otis?) was celebrated in April when this social senior turned 13 years old. He got a squeaker toy which is his absolute favorite thing, a hamburger with dinner, and a pup cake for dessert. A belated Happy Birthday, Otis, from all your MAESSR family!!! What does Otis love more than being outdoors? He loves being outdoors when it’s cold! Otis is enjoying winter with gusto. He absolutely doesn’t want to come inside. At a visit to the vet, one of the techs thought Otis looked like her Mountain Dog. It’s probably true, as much time as he likes to spend outside. Otis enjoyed the holiday season and loved his new squeaky toys that his parents got for him. It wasn’t long before the toys had no more squeakers…Odie had punctured the entire squeak out of each of them. More than his toys, he really loved joining his family in the dining room for holiday dinner and getting the leftover rib bones. He’s been a very special boy. There is one additional thing that Otis loves more than cold air…SNOW! His mom was worried when the blizzard was headed their way: How would the old guy get around in all of that deep snow? Otis and his brothers spent the day before the storm in the yard with their dad, preparing. Once the shovels and snow blower were ready, Odie was worn out. He came inside for dinner and retired for a good night’s sleep. The next day, Otis and his little girlfriend made paths all over the yard, carefully packing down the fresh snow. They kept this practice up for two days, making sure they had a path. His routine was: Outside for a bit…then inside to warm up…then back out. It didn’t hurt that his foster dad was busy with the snow blower, plowing out an area for Otis to “go.” On several of his outings, Otis would plop himself in the deepest snow pile he could find. He would wander around the yard on one of the paths he’d made, all the while looking for critters. He was disappointed that there were no squirrels, but he then enjoyed rolling and frolicking with his friends. He even seemed to like getting dried off with a warm towel from the dryer when he came inside. With spring on the way Otis is eagerly awaiting the MAESSR picnic season. He hopes to see you at one this year, so make a point of stopping by to see Odie! Otis is doing quite well and is happy the heat of summer is gone. The heat and humidity really bothered him but, after a “hotspot” healed, he was ready to go. He spent a few days enjoying the beach with his dad. Such a happy boy, he was getting some one-on-one attention. Not one to enjoy water or swimming, poor Otis couldn’t cool off by taking a dip in the waters of the bay but, he enjoyed his evening walks and getting a first-hand look at the sights of beach life. Otis attended the October Springerfest in Maryland and was a perfect gentleman. He enjoyed meeting new people and seeing the other dogs. He was especially excited when his Aunty came to see him and won a bag of squeaky toys for him and his brothers to share. We all know how Otis loves squeaky toys! The toys didn’t squeak for long as Otis chewed them to puncture every single squeaker. He then relegated the toys to the 10 month-old puppy that frequently comes to stay with his family. Speaking of the young pup, Otis seems to have taken a liking to the little girl and has been teaching the art of squirrel hunting in the yard. They both love being outdoors in the cool fall air and spend countless hours chasing the squirrels away. It was a cute sight to see, with Otis cueing the pup when it was time to chase and when to be still and quiet so the squirrels didn’t know they were there. They lay side by side at the top of the stairs on the deck watching; then they would take off when the time was right. Though his new friend is much faster than him, Otis can still keep up when tag-teaming any varmint that comes into the yard. Each and every day Otis seems to be more comfortable with his brothers and has even started to join them for a bedtime snack every night. He is always polite and waits his turn patiently. Though Otis still requires his own space for respite from the busyness in his home and the sometimes rowdy behavior of his brothers, he is making strides daily. He has only had a few instances where he felt he needed to protect himself from being toppled. He was even observed sharing nap time on the sofa with one of his brothers. Yay Otis! Otis made a new discovery in his home when contractors came to do some work. He discovered a new door that went upstairs. His dad had taken the contractor to the second floor of the home where the work was to be done. His dad heard a noise and there stood Otis at the top of the steep stairway. Way to go, Otis! Otis wishes everyone a Happy Thanksgiving and wants to remind everyone that he can be seen frequently on MAESSR’s Facebook page. Mr. Otis has finally found his forever home…exactly where he was all along! Otis recently spent some vacation time with his Aunty by the bay, and she mentioned that adjusting to a new home and people might be a little difficult for him. His foster parents agreed, realizing that change can be tough on an older guy like Otis. Seeing as he adjusted so well in their home, happy and comfortable with his life, his family decided to keep this young-at-heart boy right where he is as a permanent foster. 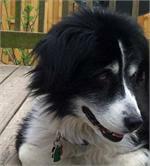 Otis is a wonderful example of how MAESSR and its loving volunteers help create storybook endings for so many dogs. His parents promise to keep you posted on Otis’ future adventures! While Otis enjoyed spring, he doesn’t like this sneaky summer heat as much. He has been waking early for breakfast and getting his morning exercise before the heat of the day kicks in. Afterwards he takes a brief rest on the deck, keeping a constant watch for any squirrels that might try to invade his yard. During the day after a brief patrol through the yard with his buddies, he heads back in to the house and air conditioning! Lucky, lucky Otis spent a few days with “Aunty” on the Chesapeake Bay while his foster family was away. What a wonderful vacation he had!! He found some new critters to chase…ducks and geese. But, since Otis doesn’t like to swim, his new prey just waddled into the water for an easy get away! He did go for walks to the community boat ramp, where access to the water would be easy for him, but stopped at water’s edge every time. This senior was happy to be the only guy in the house and soaked up all the attention and enjoyed all the treats for himself. Otis is a very kind, caring boy. His aunty has a very loud sneeze. One day she sneezed and Otis came flying from the other room to see that she was O.K. Good boy, Otis! Otis enjoyed the cool breezes from the bay in the evenings as he lay under a shade tree. He loved rolling in the lush green grass while watching birds fly out over the water. He even managed to chase a wayward bunny out of his vacation yard. Otis is doing great and, like the rest of his MAESSR family, is just trying to stay cool. He’s hoping that maybe you might like to spend Independence Day with him as your new best friend! Otis has really been enjoying the spring. He went to the “spa” and had a bath and new cut. 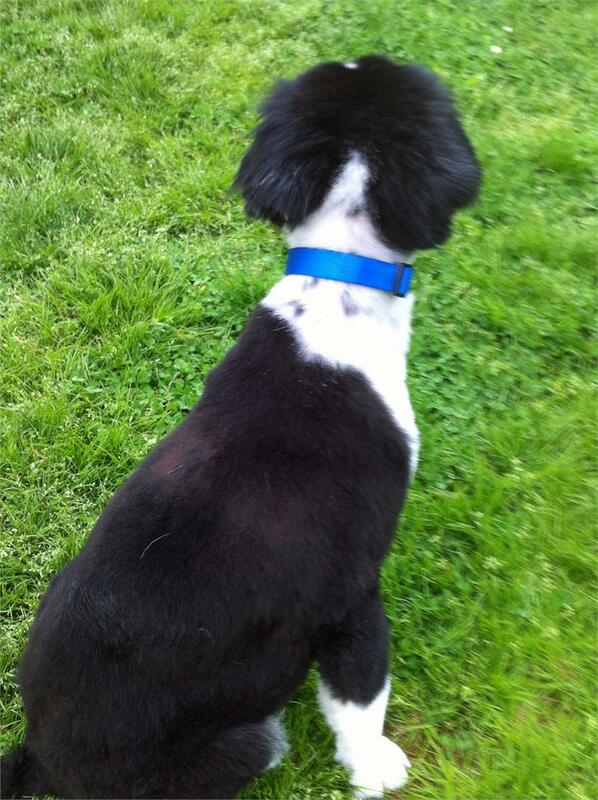 He’s rather handsome looking, sporting his new “sideburns.” And his Springer freckles really show, now!! He’s one good looking guy. MAESSR’s senior citizen attended the Langhorne picnic in early May and had a great time. He enjoyed watching the games and races the other Springers were playing so much he decided he wanted play too. Did you see? Otis raced to see who could get from one side of the race track to the other and sit. Everyone was cheering “Go, Otis.” Though he didn’t win, he did amazingly well as he dashed along and sat when he reached his foster dad. He also met a lot of new humans who brought him squeaky toys. Otis loves squeaky toys and is a pro at “de-squeaking” them. His new toys didn’t last long, and he had a great time destroying the squeakers. He managed to make them all silent before it was time to get back in the car for the ride home. He met some new dog friends and did well with them also. Meanwhile, back at his foster home, spring has brought a lot of wildlife to Otis’s yard. Squirrels, bunnies and robins are all over. Otis patiently sits on the deck every morning until he sees a bird or squirrel and then he takes off after it. 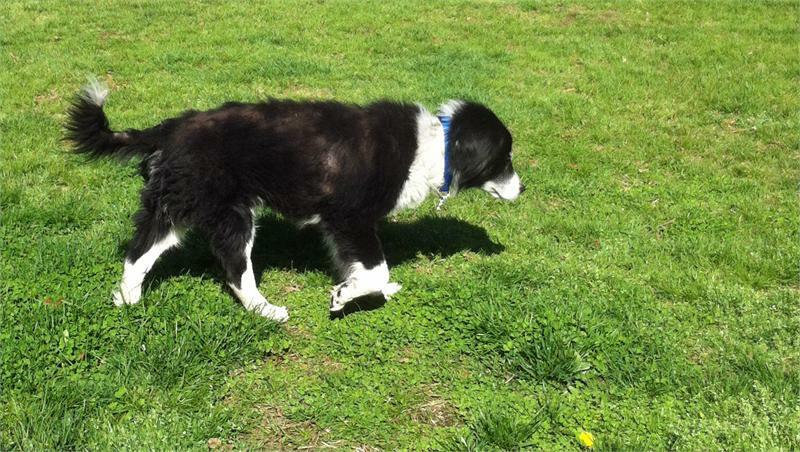 He successfully manages to keep them out of his yard by chasing them away…nothing but a clean yard for this guy! He continues to do well on his daily regimen of two ½-mile walks per day. He starts out with all his foster brothers and then splits off and heads home. Otis does well on his leash and continues to like to lead. His foster parents have discovered that not only does Otis like to lead, he also likes to be out in front of the pack. Like two-legged seniors, Otis is keenly aware of the issues he has with balance. For this reason he does not do well with other dogs in crowded situations. He seems to become fearful of tripping or falling in circumstances where dogs may bump each other while getting attention from humans and will defend himself if he feels he is in any danger of falling or being hurt. Generally Otis does extremely well with his foster brothers and moves about the house freely with them. He eagerly greets visitors at the door by getting in line with them to see who’s there. Otis is always happy to greet people at the door. Do you need a new security system? Well look no farther than Otis…“Otis Security,” that is. One day Otis’s foster family was going out. They all left the house, shutting the door behind them. Then there was a strange sound. Otis heard someone at the window! He ran to the window and stood there barking up a storm. But, he thought he saw his foster dad and stopped for a second. What to do, what to do??? Otis’s people were all away and Otis knew they wouldn’t return through the window. Turns out Otis’s foster family had locked themselves out, and his dad was just checking to see if a window was unlocked. But, with Otis and his excellent hearing, no way was anyone who shouldn’t be there getting in the house. Way to go Otis! He has also mastered the art of getting on the sofa so he can see out the front window. He guards his home with pride, barking a few times to let his foster family know someone is coming. Otis is an extremely well-behaved lovable guy who smiles almost constantly. He loves to cuddle while watching TV with his people and lives for back and ear scratches; “Oh, they feel so GOOD,” he says. He is very appreciative of any affection he gets and will happily return it by giving his famous Springer kisses. 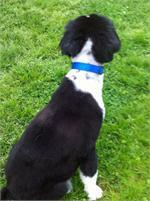 Otis would love to have a forever home where his person is home during the day; he might also enjoy a canine friend. Wouldn’t you like to have this fellow with the white eyebrows, handsome sideburns and Springer freckles keep your yard free of varmints this summer? Otis is a young, lively senior! Update 04/21/2015: “He also really likes car rides. Just say “R-I-D-E” and Otis is at the door ready to go! Otis moved to a new foster home due to puppy troubles. Otis just wasn’t up for daily activity at such a fast pace as pups enjoy. He felt the need to protect himself from the pups who even tried to eat his food! Settling in nicely with his new foster family, Otis gets along great with the three senior male resident Springers and has really blossomed in the last few weeks. He enjoys walks in the neighborhood and has met several new four-footed friends as well as their humans. Always eager to say hello, Otis fits right into to the community’s habit of waving hello and taking walks with new found friends. Otis is full of life and personality. He has become good friends with the resident Springers and he follows one special friend, who is close in age, everywhere. He spends time with his pals in the yard chasing and hunting squirrels. This boy is a pro at protecting his yard from strangers, too. He only barks a few big barks, just to let those on the other side know he is there; he then proudly lets his people know that he is looking out for them. Otis is a good boy. He’s always smiling and happy…just check out his new picture at the top of his page. That’s one happy, happy boy! He’s most happy when outside with his foster dad and brothers, and he really enjoys rolling in the grass. Otis loves to go for a walk; he doesn’t pull, but likes to lead. He is comfortable with his two half-mile walks each day. He also really likes car rides. Just say “R-I-D-E” and Otis is at the door ready to go! He puts his front paws up and patiently waits for a little boost inside. While he is capable of getting out of a car on his own, getting in or out of an SUV or truck would require some assistance from his people. A good boy in the house, Otis doesn’t bark much. Although interested to see what his people are eating, he doesn’t beg at the table and just lies down in the other room until the meal is done. This sweetie enjoys some cuddle time with his people but he isn’t a shadow. If his foster parents leave the room, he will patiently wait for them to return…as long as they aren’t gone too long! He’ll come looking for them eventually. Otis is extremely well-behaved and is a good listener. He knows commands such as “sit,” “down,” “stay,” “come,” and “paw.” He’ll give a paw all day long in exchange for treats and ear scratches! Polite behavior extends to visitors, too. 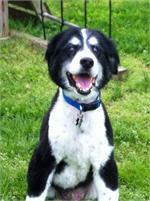 Otis likes to greet visitors with his tail wagging and a big smile on his face. Family friends recently came to visit with their two year-old Chihuahua and Otis had a grand time running and trying to catch the little guy. Otis was a perfect host, too; there was no grumbling in the house, in the yard, or on walks. Otis would love to have a forever home where his person is home during the day. He would likely enjoy having a canine friend, too…but hold the puppies, please! Can’t you just picture this sweet boy as part of your household? “Hi folks, my name is Otis. Thank you for visiting the MAESSR site and clicking on my page. They call me Otis 2 here because there was another Otis before me. My foster mom calls me Odie-Odie and I think it’s funny. I am doing great here in my foster home. They have been taking good care of me and making sure I feel better. I don’t really mind going to the vet, but whoa…that microchip needle was a surprise! I love going for rides. A trip that was a little more fun than the vet was a visit to the pet store. I had a ball meeting several new dogs and humans. My foster parents bought me a squeaky toy and, when I got it home, I had a great time tearing it to pieces. I don’t play around a bunch anymore, but I will get frisky if you want to. I do have a good sense of humor and I smile a lot! You probably read about my hips. It happened a long time ago and I really don’t remember, but I’m not complaining. The vet set me up with some pain medicine which takes the edge off, so I am fine getting around. I live here in the main room of the foster home and sleep on a blanket or in my doggie bed. That’s all I need. I’ve never used a crate but I don’t need one. I know how to behave when I am left alone, but I do like watching TV and being with the family. It just seems right when everybody is together! I like being part of a family and I’ve started helping out around the house. If someone comes through the door that I don’t recognize, I will bark once or twice. And if my parents leave the curtains open on the sliding glass doors, I’ll make sure they know if I see anything to report. But mostly I just hang out and smile. Oh, and I know how to do tricks! I trick my foster dad into giving me treats by sitting when he asks me to or for shaking his paw. And he usually gives me a treat or two after I take him for a walk. He’s elderly too, so I need to make sure he gets his exercise. I heard a rumor the other day where somebody said that adopting senior dogs is a bad idea. I humbly disagree (RUFF!) I have been called an elderly gentleman and that’s a title I take great pride in. I know what being a great dog is and I have no reason not to be that dog. You won’t get that from all the young whippersnapper dogs. So, if you have read this far and are thinking about adopting me, I have a bet for you: I will bet you 10 doggie treats that, if you visit with me, you will fall in love with me and take me home with you. I promise that if you do, I will fall in love with you and I promise that I will be a great dog, friend, and companion. What do you have to lose? You could either get a great dog or win 10 doggie treats! Otis became a MAESSR foster dog because his Pennsylvania owner was killed in an auto accident and his remaining family was not able to take care of him. 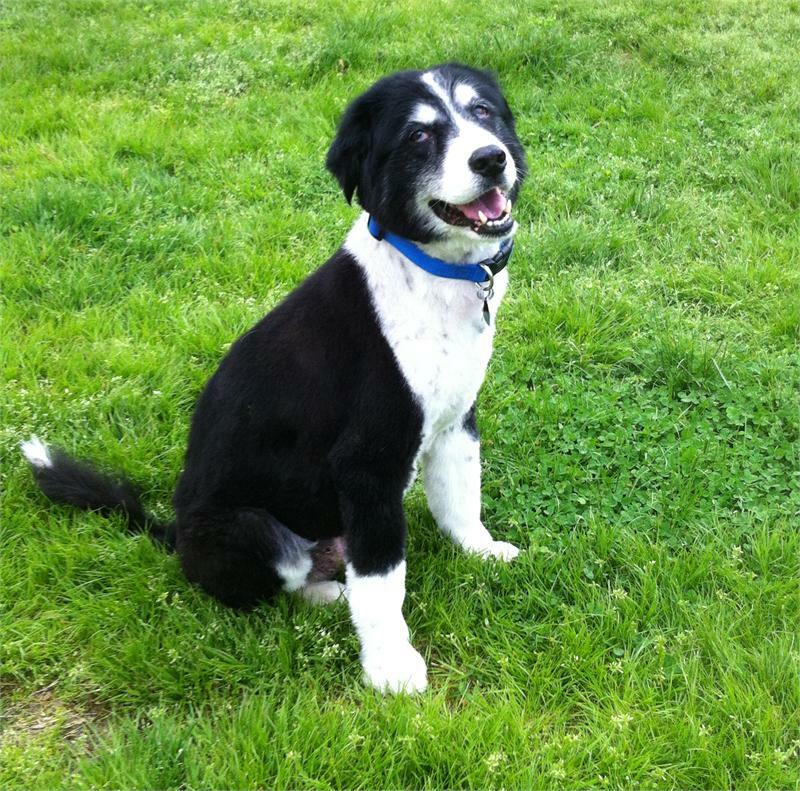 A sweet Springer Spaniel mix with a gentle soul, Otis was not sure of his change in living situation and initially seemed to be waiting for his master to come home. However, he is good with adults and likes everyone he has met. He will bark once or twice if someone new comes in the front door, but just to let his family know that he is on duty. With a quick sniff, he is wagging his tail and happy to let his new friend scratch his ears or even give him a hug. He will lick a friendly hand to show his affection and will give kisses if allowed. After the first week he began to recognize family members when they came through the front door and he now comes over with his tail wagging to greet them. Otis has had some mobility problems all of his life. (The previous owner took Otis in around the age of 2 because the original owner did not want to deal with Otis’s hip problems.) Otis’s current veterinarian said that Otis’s hips are not like one typically sees in hip dysplasia. The ball ends of his hips are still in the sockets but the bones are disconnected to the balls. Otis manages to get around pretty well considering, though he does it in his own way and currently is limping on the front as well as the rear. The vet prescribed pain meds for Otis to take twice daily and he is also being given joint supplements. His other health issue is minor; Otis had a bit of a skin condition may have been due to a previous flea allergy. Since he is on flea and tick preventative, his skin is no longer inflamed and is obviously healing. His foster family is giving him fish oil with his food for his coat also. Otis is extremely smart and his senses of sight, smell, and hearing seem spot on and remarkable for his age. 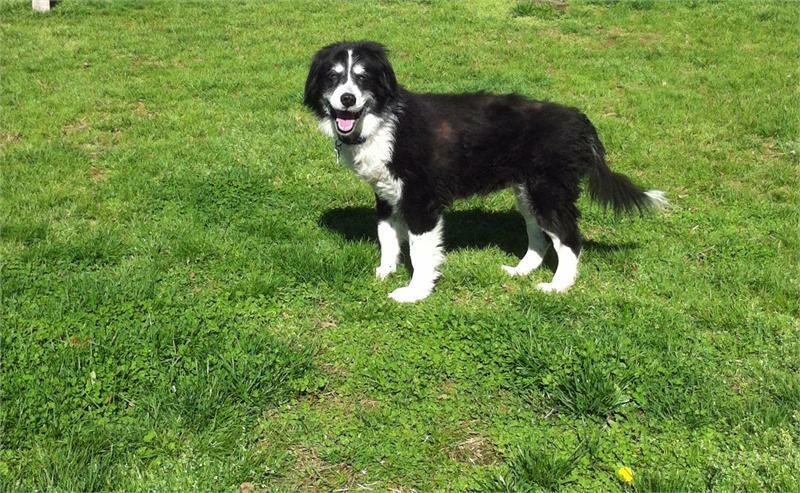 Because of his mobility issues, Otis’s forever home should have as few steps as possible. His foster family lives in a three story townhouse, but Otis primarily lives on the main floor. He can manage a few up/down steps like the front porch but a flight of stairs is challenging (though he will do it with encouragement). Another factor concerning his limited mobility in his forever home may be young children. Since he cannot run, it may be that young active children may be too rough with him and he couldn’t get away from them quickly. Otis has nice house manners. He obviously does not jump up on people and does not expect to be allowed on the furniture. He pays attention to family members if they are eating food, but he does not beg at the table. A “Go lie down” will end his interest in people food. He is not a counter-surfer, either. Housetrained, he lets family members know that he would like to go outside by stretching and sitting before them. There was a concern that Otis reportedly was food possessive around other dogs but the present foster home (who has no other animals in the house) has seen absolutely no aggressive behavior of any kind. Otis is very gentle when receiving treats and his food bowl can be picked up at any time. Otis was very polite around a laid back cat at the vet’s office, but he may be inclined to chase them (or at least think about it). A kitty could easily retreat from Otis because of his inability to run, though. Otis eats regularly twice a day and walks well on a leash. He stays on the main level of his three story townhouse and his food and water are given in the kitchen. He politely sits when taken to the door for a walk while the leash is fastened to his collar. He knows his name and willingly responds to “come” and “sit.” He enjoys riding in a car and even on a long trip, he does not get car sick. This kind gentleman would like a quiet forever home where he could be an only child. Sleeping most of the day and all of the night, Otis is a low energy, low maintenance guy who is very easy to care for. He needs a little boost to get into a vehicle but otherwise anyone could care for him with little physical exertion. So, he would fit into many families and be a fine gentleman and companion. Otis is a happy dog and now he isn’t watching the door for his master to come home anymore. He is ready to adopt a new forever family!